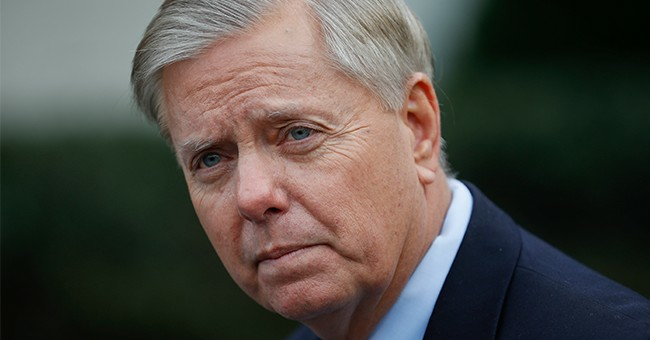 WASHINGTON, D.C.-- Sen. Lindsey Graham (R-SC) spoke Wednesday before attendees at The Federalist Society’s first annual Legislative Branch Review Conference. The conference was held at the United States Capitol Visitor Center’s atrium. Graham, who is also the chairman of the Senate Judiciary Committee, gave his remarks about the current state of extremism in Congress and how he hopes to shape the Supreme Court. Graham explained that the Federalist Society is the kind of organization that Republicans would turn to when they need advice on who to nominate for the different sects of the justice system. “Where do you think the Democrats go? Who do you think they talk to?” Graham asked. Graham argued that the way the parties nominate judges is similar to that of any other election. The danger to that mindset, he suggested, is that the government ends up introducing the worst elements of politics into the supposedly non-partisan judiciary branch. Graham pointed to Brett Kavanaugh’s hearing as a prime example of the issue. He believes that in the future, it will be difficult to find potential nominees for the Supreme Court who will willingly come forward to serve. “What Kavanaugh went through was unconscionable and I hope it never happens again,” he said. Graham commemorated the Federalist Society for maintaining a desire to nominate judges who uphold the Rule-of-Law from a conservative point of view. The senator said he doesn’t desire “right or left” ideology to taint the dignity of the court system. Graham promised to do what he can to get more qualified conservative judges on Trump’s watch. On top of that, he said he’ll be looking for younger judges who can serve their role for a long time and who come out of the private sector to serve. The Federalist Society for Law and Public Policy Studies is an organization dedicated to reestablishing conservative values in the legal system. The Legislative Branch Review Conference brings together congressmen, academic figures, and policy analysts to discuss the state of the nation’s judiciary.